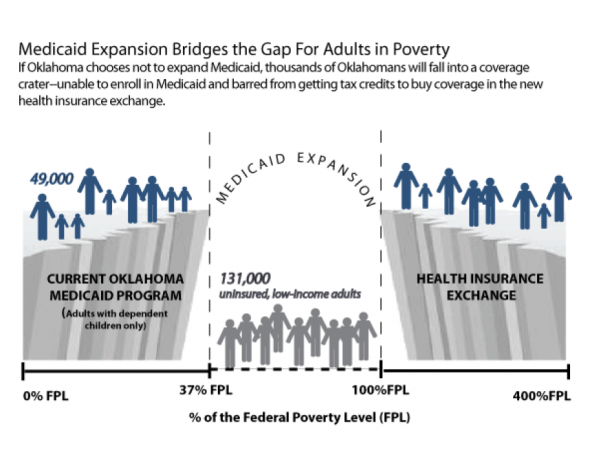 This afternoon citizens from all over Oklahoma plan to rally at the State Capitol in protest of Governor Fallin’s decision to turn down federal funds to expand Medicaid coverage.The people that would be covered by this expansion are essentially the low-income working uninsured. Just because someone falls under the poverty line, doesn’t mean they are lazy and not working. Many factors play into someone’s ability to work such as disability and the like. In a country where mega marts can hire people for less than 30 hours a week and pay them $7.25 an hour, which is what minimum wage is these days, what is a working person to do? Many of these companies don’t offer health insurance, as their idea of health care is directing their employees to file for benefits from the government. What happens when you make slightly too much to be considered really, really poor? So what are the main view points? The conservative side, Oklahoma Council of Public Affairs believes that the expansion will prove too costly for Oklahoma. There’s also the usual complaint that Medicaid is wasteful and riddled with fraud. “Good for her. As I point out in the current issue of the Oklahoma Gazette, “Gov. Fallin should be applauded for saying, ‘No thanks,’ to the Obamacare Medicaid expansion. It took some political courage — many of the crony capitalists who supported Obamacare and its Medicaid expansion are significant GOP players — but it was the right decision. Quite simply, it’s a bad idea to borrow money from China in order to expand a dysfunctional, fraud-ridden welfare program that is almost certainly the worst health plan in America.” I encourage you to read the whole article here. It is here I would point that there are members of the GOP who do support this expansion. On the flip side, the liberal view point is that we are turning down the opportunity to improve the health of citizens, bolster the financial situation of health care providers, and strengthen our state economy. “Not expanding Medicaid also means that federal taxes paid by Oklahomans will be spent on health care in other states, not here in Oklahoma. Hospitals, community health centers, physicians, and other medical providers across Oklahoma will continue to absorb unnecessarily high levels of uncompensated care, while shifting costs to Oklahomans with insurance through higher charges and insurance premiums. To put that in perspective, we’re only paying 10% of the expanded coverage starting in 2020. We plan to visit the rally, which seems, according to the organizers, to have drawn people from as far away as Tulsa and Ada. From the Facebook event page it seems at least 300 people will be attending. According the the event page speakers representing the health industry, social welfare, the faith community and state elected officials will be there. Citizens will also give testimonials about the direct impact of the Governor’s decision to reject the expansion. A Sign-On Petition, which currently has 4,377 signatures, will be presented to her during the rally. We will continue to cover this story as it develops. Tagged Brandon Dutcher, community, David Blatt, GOP, Governor Fallin, Mary Fallin, Medicaid, Obamacare Medicaid, OCPA, oklahoma, Oklahoma Gazette, Oklahoma Policy Institute. Bookmark the permalink.